I can’t say it was a great nights sleep I’d had. Far from it. First nights away from home always seem to cause me sleep problems but this was worse than normal. And so it came to pass that at 3:30am I was awake and listening to a programme on the BBC World Service which spent half of its time telling us how wonderful BBC Monitoring is, and the second half tackling with a complaint from someone with a solar powered internet connection in South Africa, who found it took them ten minutes to download the schedules. I’d drifted off by around 4:30 but still awoke around six, lying in a hostel dorm that could hold seven, but which I was the only one in. By 7am I’d given up on any pretence of sleep, got up, scoffed some muesli and got ready to go. 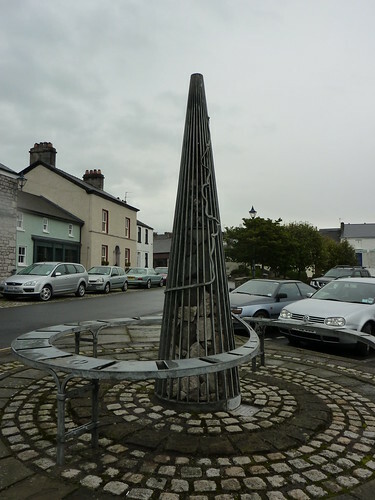 I’d left by eight and was at the fancy sculpture at the start of the Cumbria Way by 8:30. It had been raining when I’d finally got out of bed, so the few people out and about that fair Sunday morning saw me rustling down the street fully decked out in my waterproofs and expecting the worst. It was damp, but at least it was dry. Okay, not the perfect way to start the 14½ mile walk, but it would have to do. I even got as far as taking my waterproof rucksack cover off, until it began raining a mere moments later. 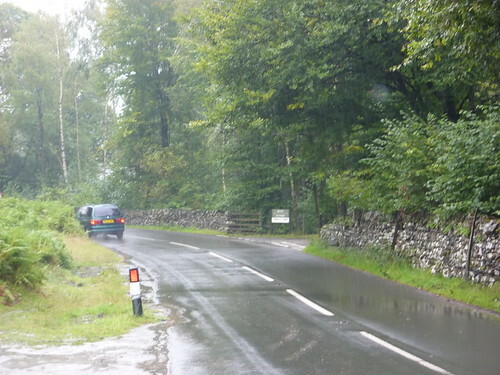 It was barely a mile before I hit the Lake District National Park at Gawthwaite when the weather really decided I needed a good, old fashioned, Lakes welcome. Light but constant rain came at first, and the cloud came down. Half an hour later as I approached some moorland, it was coming down constantly. To make matters worse, it was lunchtime, I was hungry and there was no where to shelter. For a few minutes there seemed to be a chance that the rain was giving up, but barely had I sat down and started the convoluted process of getting in my rucksack for supplies, and the rain started again with a new ferocity. The lack of shelter also meant I was heading towards a disaster. With no where I could get out of the rain, I had no way of getting the right part of my map into my map case without it becoming a big piece of wet mush. All I could do was guess, and hope that I was going the right way. There was a strong, visible path and no noticeable turn-offs. It seemed logical to keep following it. It was when I finally left the moors that I first had an inclining that something wasn’t quite right. Although not the best signposted footpath, there had at least been some signs for the Cumbria Way most of the way. Now there was nothing. True there were no real turn offs to worry about, but when I found myself unexpectedly in the village of Water Yeat, it was obvious I’d gone wrong. Huddling under a tree, I finally forced the map on to the right page only to find out I’d gone the wrong way at a lake called Beacon Tarn, and had added two miles to my journey. There was little to do bar walk along the main road and try and get in vaguely the right area whilst desperately hoping I’d find shelter so I could finally eat my lunch. It was 12:30 and the constant driving rain was doing nothing for my morale. After what felt like an age, I finally found refuge and found myself wolfing down cheese filled roles whilst stood in the glamorous surroundings of the entrance to the gents public toilet in a car part near Thrang Crag Wood. Still, it was infinitely better than a branch of McDonalds. Salubrious a resting point it may have been, at least by getting lost I had managed to find some shelter which I simply wouldn’t have got if I’d remained up on the moors. Next to me, huddling in the doorway of the disabled loos was a cyclist, who, after exchanging the obvious weather based pleasantries (“Lovely day!”, “Beautiful isn’t it?”) spotted his support team arrive in her car, and proceeded to change into a wet suit, and went on his way. I watched with just a hint of envy, especially as by now I’d discovered I was completely sodden and that water was beginning to get into my rucksack too. The combination of sweat caused by non-breathable fabrics, and the copious, never-ending rain had taken their toll and my waterproofs had just given up. My linen shirt was a mere shadow of its normal glory, and had decided to become a giant blue sponge which rolled up into a neat ball when I took it off. My t-shirt hadn’t fared much better but my spare could not be found in my rucksack, and in the end I had to make do covering the damp fabric with my fleece instead. But the rain did seem to be easing. Maybe there was some hope. At this point I found myself with two options. I could carry on up the main road and risk life and limb as lunatic drivers hurtled round sharp corners at top speed, or I could take a side road and re-meet the Cumbria Way up on Torver Common. The latter would be about a mile longer, but at least safer. In retrospect I should have taken the more dangerous option, as back on the moorland, paths were turning to streams and streams were becoming impossible to cross. At one beck, I found myself having to make a lengthy detour and then make a running jump in order to cross without getting socked up to my knees. Half a mile further on, I had an even bigger jump. The map then featured a prominent marking of “Stepping Stones” which did not inspire much confidence, with my attempts to desperately persuade myself it was merely the name of a locale, failing to convince. 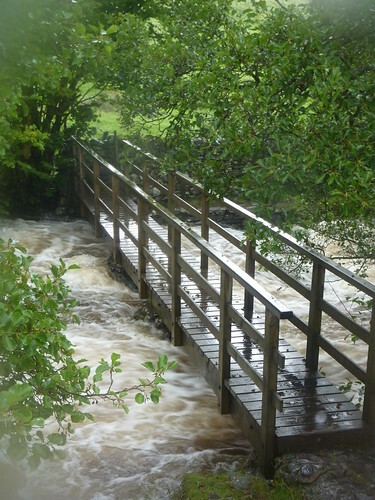 In the end it turned out that the stones had been replaced by a footbridge, but Mere Beck which it crossed, was so high that it was in danger of covering the bridge completely. 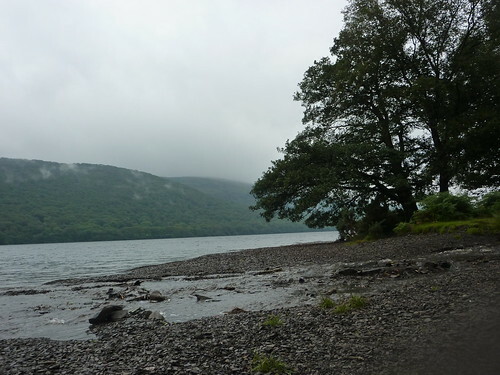 I eventually found myself back at the main road again, and shortly to the edge of the magnificent Coniston Water, and even a pier where a sign proclaimed that I could get a ferry all the way to Coniston if I just hung on for 15 minutes. For reasons now beyond me, I walked on alongside the lake edge, stumbling along on muddy paths, crossing enough streams to ensure my feet got even more soaked. Even my Gore-Tex hiking boots were struggling with the weather. With few distinguishable landmarks, it was hard to track progress and more than one I thought I was further on than I actually was. The rain had at least ceased, and as I stumbled on I became acutely aware that I hadn’t had a proper rest since 10am. It was now four, and spying a shingle beach, I threw off the rucksack and collapsed. 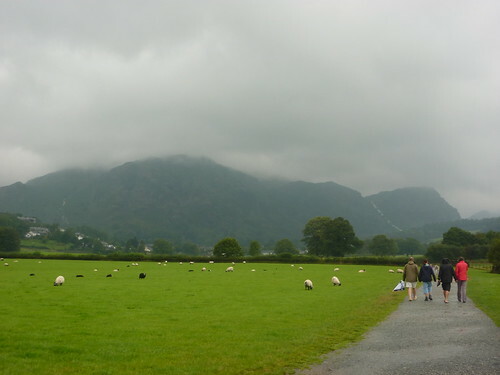 I was, at least, now reasonably close to Consiton and the local tourist industry began to surround me as I walked through a campsite I’d stayed at with Catherine back in 2000 during my last proper visit to the Lakes – a trip which we ended early thanks to the rain. Indeed the rain had returned once more, and I now walked through the campsite surrounded by the sight of drenched campers desperately trying to erect tents on the muddy field, whilst a group of children pushed a dingy through an impromptu pond, laughing happily as another child drove through it as fast as he could. 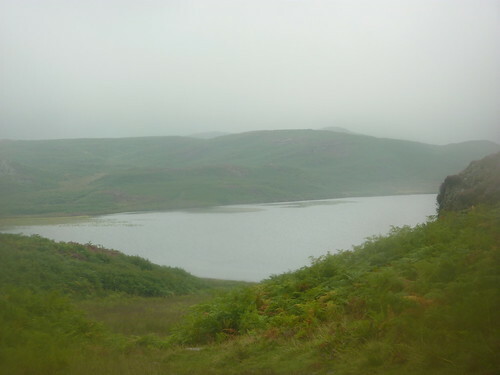 Following a precession of people, I eventually made my way into Coniston, my boots squelching as I walked along. I longed for nothing more than a hot shower and the chance to get out of my rain sodden clothes. I walked past busy pubs; the rain delighting in getting me even more wet, until I finally arrived at YHA’s Holly How hostel. Exhausted, soaked and mentally drained, when a member of staff asked if I’d just rolled down a mountain, I could find nothing more intelligent to say beyond “Somet like that”. 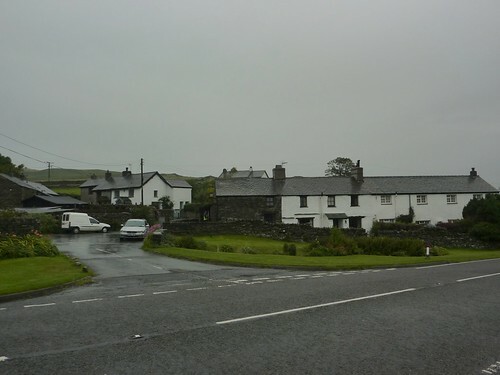 On hearing the hostel did evening meals and served local beer, I instantly abandoned my plans of popping to Coniston for food, and resolved not to leave the building until the following morning. Stashing my drenched clothing in the overly full drying room, I retired to the dining room only to find that the “handpull of the week” had finished, and it was bottled beers only, from the Hesket Newmarket brewery. Part of me was annoyed. Coniston is home to the Coniston brewery, and I’d quite fancied a visit to the Black Bull where the beer is brewed and served. But I was damp and exhausted, and it was as much as I could do to eat my food whilst hoping my boots would be reasonably dry for the morning. A typical day in the Lakes I thought! Hello! I am planning on doing the lakes next year (I’m travelling from Australia) and I have no idea about water proof clothing. Do you have any advice for the best styles or brands for weather in the lakes? Also, thank you so much for putting so much effort into this blog and website. I’ve been reading it for days and deliberating between which walks to do and what time of year would be best. You have such a lovely, warm style of writing. It’s a pleasure to read! Amanda – To be honest waterproof clothing is a bit of a minefield because there are so many different brands and fabrics out there. Preferably what you want is something made in a fabric that’s breathable. That can be a branded product like Gore-Tex or eVent, however there some really good own-brand ones like Berghaus’s AQ. That’s the core of it. The rest of it is about the comfort and fit of the jacket and the trousers. And for waterproof trousers, just make sure you get ones that will go over your boots without you taking them off. You shouldn’t really need anything other than waterproof jacket and trousers. All this stuff does cost a lot, and it may be that if you’re never likely to use them again, then just buying some cheaper non-breathable ones would make sense – especially if the weather is going to be good. I did write a little about my experiences with waterproofing in 2014 and that may give you some ideas as well. First Published: 1 September 2009. Last Updated: 27 August 2015.